You might have noticed I’ve been a bit quiet on the blogging front. I’ve started a new job back in politics, still finishing off the yacht club handover and as its now the middle of winter, we are in skiing mode. Time has been in short supply! And Im happy to report we did manage to pick up a few trophies at the recent prize giving! One was the lady skipper trophy. 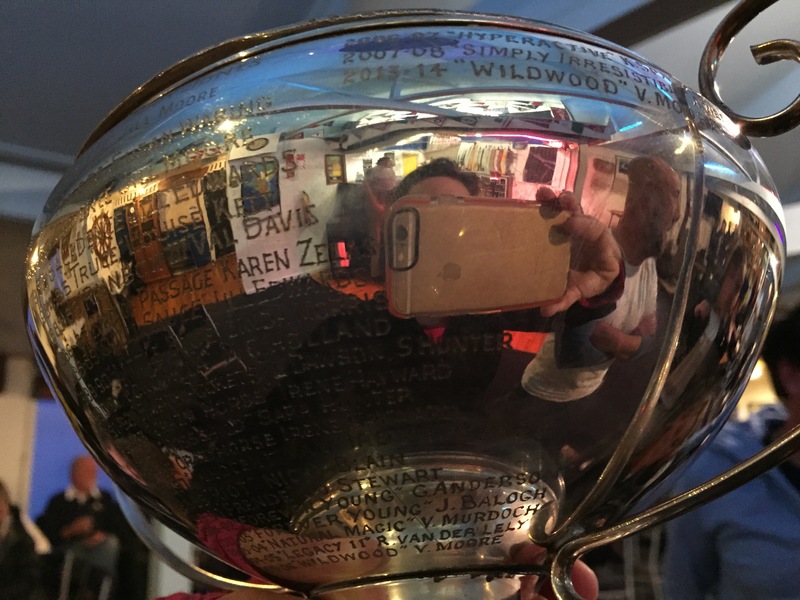 I have won this one a few times, before, but am always proud to have Wildwood’s name inscribed on the trophy along with many other women sailors whom I admire. My friend Irene Hayward’s name appears a number of times, and she has sailed her yacht up to Europe and back. The other trophy I was presented for the work I have done with the Little Ship Club. This is a little cruising club that has been around since the 1960’s and is a regular gathering of people to come and discuss all things to do with the sea. I was elected as President of the club last year, and I have managed to drag all my friends along, as well as many of the existing members, and we now have a thriving group of people doing all sorts of interesting things like learning to splice ropes, visiting the dry dock, and listening to the adventures of other sailors. It is lots of fun, and I get an excuse to organise all the things that I want to do with the added benefit of lots of people coming along and getting a trophy for my efforts! A win win situation! It is a beautiful trophy as well. We recently had a great night out celebrating the sailing successes of the Flying Machine crew. Andrew races with them in the big regatta’s around the country and they had a fantastic year, cleaning up the Presidents Cup, The South Island Champs and getting very well placed in three other regattas around the country. Andrew won an award for being a “rockstar bowman”! I have just about finished up with the yacht club, and am looking forward to handing over to the new manager who starts in a couple of weeks time. This should give me much more blogging & leisure time. Then we are off to the boat show for some serious boat shopping, the aim is to really narrow down exactly what we want on this trip. I can’t wait! And after that we have a trip to New Caledonia sailing on a 54′ yacht with some friends in September which will be brilliant. Meanwhile Wildy is having a wee rest before we haul her out for a bum clean and possibly some motor work, while we get in some skiing action – fantastic snow this year! That’s all our news! What are all you dear readers up to? Your new book sounds great. I must buy my Mum a copy as she loves horses and I am sure she would love to read it. Great to have a blog to read from you – I miss them! Congratulations on the trophies – well deserved. As for me I am doing a big promotion on my most recent book – about horses (adopting some and trekking in the bush for several months unaided) – it is 99 cents/99pence at the moment but I can only run the promo in USA and US (ask Amazon not me!) – but if you have a friend there (UK/USA) they can buy it for you! Enough about me – oh, wait, not it’s not – As you are so heavily involved in sailing organisations- if you are having an event or two, do let me know, I’d donate some of my sailing ebooks for prizes, giveaways. Congrats on the trophies and I look forward to hearing out the boat show !